Secretary of Defense Ash Carter revealed Tuesday that Western allies fighting the Islamic State have already begun preparing to invade the terrorist group's de facto capital of Raqqa in Syria before the ongoing military campaign to recapture the ISIS-controlled Iraqi city of Mosul is complete. 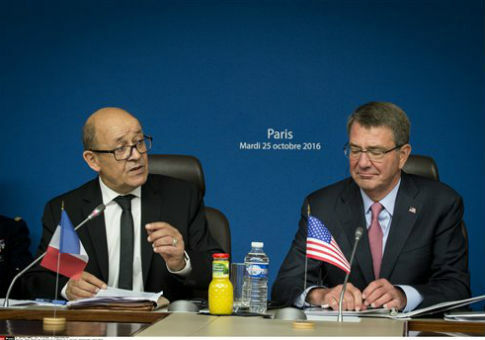 "We've already begun laying the groundwork with our partners to commence the isolation of Raqqa," Mr. Carter said. "As we meet here, we're helping to generate the local forces that will do so." The question of what ground forces will lead the invasion of Raqqa is proving to be a thorny problem for the U.S. and its allies. Turkey, a key member of the anti-Islamic State coalition, has objected to Kurdish fighters, longtime foes of Ankara, being involved in the operation. Mr. Carter on Tuesday described the soldiers that he hopes will take Raqqa as "capable and motivated local forces that we identify and then enable. The lasting defeat of ISIL can't be achieved by outsiders; it can only be achieved by Syrians enabled by us." ISIL is one acronym for Islamic State. Carter and other senior officials believe that ISIS militants may begin retreating from Raqqa to plan other terrorist attacks in the region or Europe, raising the urgency to take Raqqa to prevent further attacks. French President François Hollande said Tuesday at the start of the meeting that the U.S.-led coalition would need to focus on picking out ISIS fighters from civilian masses expected to flee when combat reaches Mosul itself, Iraq's second largest city. "We must clearly identify them, and we must be extremely vigilant about the return of foreign fighters," Hollande said. Iraqi and Kurdish forces, with American advisers, began their operation to reclaim Mosul last week and have been largely successful, getting closer to the outskirts of the city of 1.2 million people. Iraqi security forces anticipate more resistance as they get closer to the central part of the city. ISIS jihadists are expected to flee from Iraq and Syria as they lose territory, which concerns American advisers due to their likely tactic of reverting back to bombing civilian targets or using guerrilla tactics, the Journal noted. "Those who are hatching those plots, we're killing the leadership of ISIL," Mr. Carter said in Erbil on Sunday. "We're getting more and more effective at doing that." Defense officials hoped the meeting Tuesday would get the coalition to focus on what happens after Islamic State loses its main territories and becomes more of a traditional terrorist threat. "This meeting will follow up those themes, and start to push the conversation in a more focused way beyond Mosul and Raqqa," a senior defense official said. Hours prior to the Paris meeting, NATO Secretary-General Jens Stoltenberg warned in Brussels that Russian naval ships headed towards the Mediterranean could strike targets and civilians in eastern Aleppo in Syria. "The battle group may be used to increase Russia's ability to take part in combat operations over Syria and to conduct even more airstrikes against Aleppo," Stoltenberg said. "The concern is that the carrier group can be used as a platform for increased airstrikes against civilians in Aleppo." This entry was posted in National Security and tagged Ash Carter, Iraq, ISIS, Islamic State, Military, Syria, Terrorism. Bookmark the permalink.